Being a boarder at Dana Hall, I don’t have that much food choice, but my friend told me that there are a couple of good restaurants in downtown Wellesley which I had never tried before. I decided to go to Lemon Thai Cuisine, located on 555 Washington Street, and write this article to review not only the food and restaurant in general but also the authenticity of the food that could possibly bring me back home. Lemon Thai is known for their budget-friendly, good food. It was Sunday 12:00 PM, right after the opening time that my American friend and I stepped into the restaurant. There were people in a few tables, so the background noise was not that loud. It was a small restaurant. The first thing that hooked me was the scent of fresh lemon in the air and the vibrant yellow tone of the restaurant which gave me refreshing and lively vibes. There were five different kinds of Pad Thai offered on the menu, but my friend and I went for two dishes which seemed the most authentic, regular Pad Thai and the Country Style Pad Thai. They both come at the same price, $8.50 for lunch and $9.50 for dinner, which surprised me considering the cost of living in Wellesley. My friend ordered her Pad Thai, then I ordered Pad Thai speaking in the Thai language. I told the waitress in Thai that “I want the normal Pad Thai but I would want it to taste like the one in Thailand.” The waitress suggested that I should order the Country Style, and she insisted to me that the regular Pad Thai was modified to suit the Americans’ taste. So I decided to go with the flow by getting the Country Style. The regular Pad Thai arrived first; I was surprised because it didn’t seem like Pad Thai that I know in Thailand. The noodle didn’t look as juicy as I thought it would be, but it was perfectly cooked. There was no lime served aside the plate, and also no peanut crumbled on top. But it turned out that the taste of every ingredient smoothly blended in my mouth, and my American friend enjoyed this dish without burning her mouth. Even if I would give the authenticity for this dish 4/10 because of the lack of spiciness and the garnishes, it is still a solid stir-fried noodle for lunch, and my American friend gave it a 7/10. Then my Country Style Pad Thai arrived. It looked very authentic from the outside. I spotted the perfectly cooked juicy-orangy noodle and the unique smell of tamarind paste. It also came with a lime wedge served alongside, but there was no crumbled peanut on top. The taste was sour, followed by sweet and salty. The shrimp was bouncy and firm. But personally, I think that it was not spicy at all, so I asked my American friend who doesn’t usually have spicy food to try it; she said that the level of spiciness of this dish for her is 2/10. It reminded me of Pad Thai in my home that my 10-year old sister would get for herself. I gave the authenticity of this dish 7/10 because of the lack of spiciness, but my American friend gave it 8/10. My friend and I both agreed that the regular Pad Thai and the country style Pad Thai didn’t have many differences. The color of the country style Pad Thai was more vibrant, the taste sourer and a little bit spicier than the regular one. 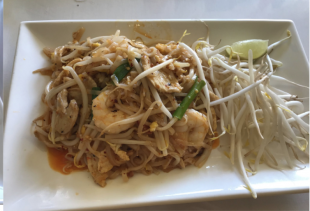 If you’re not a fan of the sour taste, I would recommend you order the regular Pad Thai, but if you want to try the one which has more Thai flavor, go for the country style Pad Thai at Lemon Thai Cuisine. Even though Pad Thai from Lemon Thai Cuisine couldn’t bring me to the front door of my home, it did make me feel like the 8,000 miles was shortened into a couple miles away from Dana Hall.